Ghurids : Pashtuns or Tajiks? Various extracts from Raverty's research paper "Who were Pathan or Patan Kings of Dihli?" published in Journal Asiatic Society of Bengal Volume 44, 1875 and his extensive footnotes on the subject in his translation of Tabqat-i-Nasiri by Minhaj-i-Siraj. 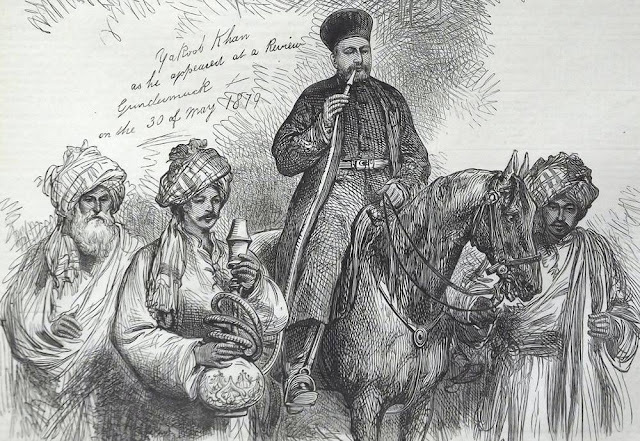 Major H.G.Ravery (1825-1906) is noted for his book on the Pashto grammar and writing a dictionary of Pashto. “Sultan Mahmud made raids upon the Afghans in 411 Hijri, and, again in 416 Hijri , but they are never mentioned in connection with the Ghurids by Baihaki and such like trustworthy authors ,a pretty good proof , were any wanting that , although Afghans are Pathans, the Ghurids are not , and never were so accounted by any historian , nor by the Afghans nor Ghuris themselves. It doesn’t follow that, because a Tajik It doesn’t follow that , because a Tajik is called Suri , he should be of the Afghan clan of Sur , of the tribe of Ludi, so styled from their progenitor, named Sur, but not Suri. Utbi also makes a difference , as do all writers of any knowledge of their subject , between Ghuris and Afghans , and never confounds them. Raverty criticizes the incorrect translations of Tarikh-i-ferishta by Dowson and Briggs. “In the Following year Mahumd led an army into Ghoor. The native prince of that country , Mahomed of the Afghan tribe of Soor (the same race which gave birth to dynasty that eventually succeeded in subverting the family of Subooktugeen), “ etc. A few lines under the above quotation , Ferishta refers to Tarikh-i-Yamini and quotes the author of Tabqat-i-Nasiri with reference to the conversion of Ghuris to Islam, and says, “but the author of Tabqat-i-Nasiri and Fakkhr-ud-din Mubarak Shah the Marwa-ar-Rudi, who composed a history, “ etc. but Dow leaves out this entirely ,and Briggs , such seems the infatuation for viewing all things in a “Pathan” light , translates the last part of Sentence [p.50] “Fakhr-ood-Deen Mubarak Lody who wrote a history” , etc. Instead of Marwa-ar-Rudi , he read Ludi , the name of Sultan Bahlul’s tribe, which, no doubt , he thought must be correct . People referring to these translations ,and finding this statement reiterated , time after time, that the Ghaznavids and Ghurids were “Afghans or Pathans” , concluded that Ferishta must have so stated , and that he must be right ,and so they wrote their accounts of “Pathan Sultans” , “Pathan buildings” and “Pathan coins”, but they do not seem to have considered that, even if Ghuris were Pathans, it didn’t follow that their Turkish slaves , and other Turks , and Tatars, should also be Pathans. I do not doubt that many Persian scholars will be surprised to hear that there is nothing of the kind whatever in Ferishta , any more than there is in any other Asiatic writer , but such is the fact , and ferishtah’s text on examination will prove it. Ferishta’s account of Sher Shah Suri in correct translation of Tarikh-i-ferishta is – “ The name of Sher Shah was Farid, and his father’s name Hasan , who is of the people of Roh. When Sultan Bahlul Ludi attained dominion, the father of Hasan, the Sur, who was named Ibrahim, having evinced a desire of obtaining a service, came to Dihli”. He then describes Roh , and adds, “ The Afghans there are of several tribes , among which is the clan of Sur. They account themselves of the posterity of the Sultans of Ghur , and say that one of their sons who was called Muhammad Suri – came among the Afghans of Roh [if the Afghans were Ghuris or the Ghuris Afghans , as it is pretended, and dwelt in Ghur , how could this person be an exile from his country among his won people , I his own country?] and as the correctness of his descent was verified [to the satisfaction of] one of the Afghan chiefs , notwithstanding it is not the customs of Afghans to give their daughters to strangers, that person [chief] gave his daughter to Muhammad-i-Suri , and made him his son-in-law ; and , from him offspring having offspring , they became known as the Sur Afghans , and may be the greater of the tribes of Afghans”. Raverty says that ferishtah himself blundered greatly when he said that the son of Ghuri chief who took up his abode among the Afghans was called Muhammad-i-Suri, and that his posterity are known as Sur Afghans. The Afghan tradition is very different. According to it , the chief’s son was named Shah Hussain , he was said to have been descended from the younger branch of the Ghorian race. While Muhammad-i-Suri , said to be great-great grandfather of the two sultans Ghiyas-ud-din and Muiz-ud-din , was descended from the elder branch with whom the sovereignty lay. This Shah Hussain , by one of his Afghan wives , had three sons, Ghalzi, Ibrahim (surnamed Ludi) and Sarwani. Ludi had two sons, one of whom was named Siani, who had two sons, Pranki and Ismael. The latter had two sons , one of whom was named Sur , who is the founder – not Muhammd ibn-i-Suri the Ghorian – of the Afghan tribe of Sur The name of Suri occurring among the Ghuri Tajiks and Sur among the Afghans , immediately struck Ferishta probably , and , he at once , jumped at the conclusion that they were one and the same , and that the Ghurids were Afghans and Afghans Ghuris. "The defenders of truth , in conformity with Ulugh Khan-i-azam (Balban)’s commands, penetrated into all the loftiest places , into the defiles , and deep ravines , and acquired heads and captives , and became filled with property and money , especially the sept of Afghans, every one of whom you might say was some huge elephant with two Khita-i bulls, over his shoulders, or some tall tower of a fortress , placed on its summit , for the purpose of over-awing , with banner displayed. The number of them , employed in the service of , and attending the stirrup of Ulugh Khan-i-azam , was about 3000 horse and foot , daring , intrepid, and valiant soldiers , each of whom . either on mountain or in forest, would take a hundred Hindus in his grip , and , in a dark night, would reduce a demon to utter helplessness ."